Popular vinyl wrap questions asked about our products and services. Our furniture vinyls are installed by our trained technicians, maintaining very high standards and provide a long lasting professional finish. Do you offer your service in my area? We are base in Bordon, Hampshire. We operate all over the UK and parts of Europe. Will the vinyl fade, lift or peel after a few years? No. Our vinyl furniture wraps have been designed to be a hardwearing long term solution. They are very resilient to abrasion, ultraviolet light (UV), including some acids, steam and water. Professionally installed all our products have a 10 year warranty against peeling, discolouration and fading. These vinyl’s are also heat, mould, abrasion, microbial, stain and fire resistant. All our vinyls meet with current child safety and environmental standards and A+ fire rated. Can you wrap bedroom furniture? Yes. Most non-porous and smooth surfaces can be wrapped, including untreated MDF, walls, columns and ceilings. Whether it’s walls, bathrooms, bedroom wardrobes, cupboards, tables, worktops or doors we can wrap it. If you are unsure, call us or send us a picture and we will have a look. Would the wrapping effect our furniture and fixings? For a professional finish, all fixtures and fittings such as door handles, hooks and locks can easily be removed and replaced once the vinyl has been applied. Are these furniture vinyl wraps the same vinyl’s used to vinyl wrap cars and commercial vehicles? No…. Vehicle vinyl wraps are constructed from a thinner material and mainly used for advertising that can be easily removed returning the vehicle it to its original colour without the need for expensive repainting. Our furniture vinyl’s are designed to be a permanent solution. Constructed from a tough thicker material, including very strong adhesives that will not shrink over time. 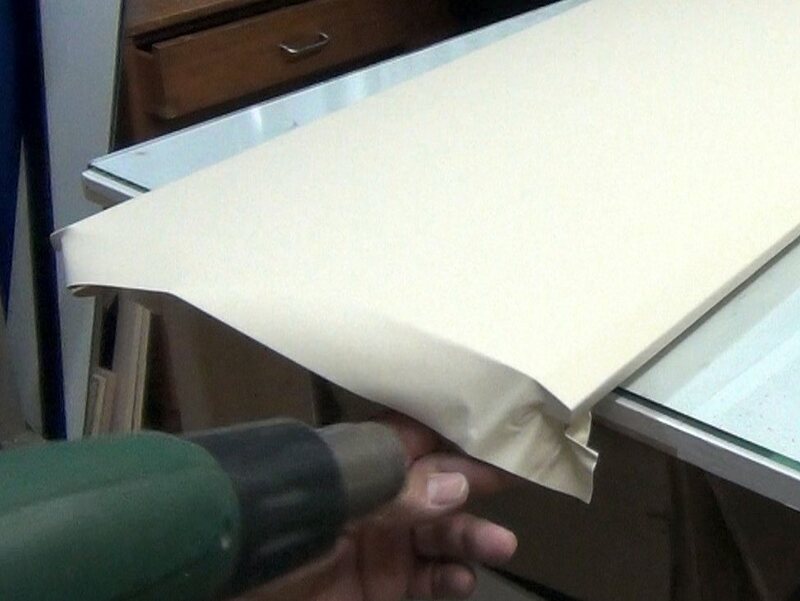 Unlike lighter vehicle vinyl wrap adhesives that can be easily removed from the substrate. All our furniture vinyl’s are easy clean, fade, abrasion and hardwearing finishes for a long life. A small kitchen normally takes one day to complete. When quoting a project, we will give you an estimated time to complete the works. Do you supply for DIY? Sorry no. Our vinyls are professional products, which require trained technicians to install, maintaining very high standards, comply with the manufacturer’s specifications and warranties. Can you apply vinyl wrap on my worktops and will the hot pan damage the vinyl? We can apply to most worktop surfaces. It would be safe to make a cup of tea on your vinyl surface. However we would not recommend that you can put a hot saucepan or baking tray directly of the hob onto the vinyl.